If you've ever driven up to a scenic mountain lake and found yourself wishing you had a paddleboard or a sea kayak to play with, Airhead's inflatable Na Pali is worth a look. When not in use, the Na Pali rolls up into a reasonably compact package—about three feet by one feet—certainly small enough to fit in your trunk. 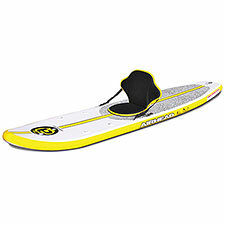 Inflate the Na Pali via the included high-pressure hand pump or better yet a 12V plug-in accesory pump, and you get a full-size paddleboard that is almost indistinguishable from a rigid fiberglass board. The Na Pali is a far cry from the inflatable pool toys of yesterday. Its specially-threaded fabric allows it to withstand an impressively high 12 psi of air pressure, resulting in a board that is rigid and stable, just like the real thing. Of course, you do have to inflate it first, and that is a bit of chore. Expect total setup time in the half hour range, more if you're doing it entirely by hand, less if you've got a powerful automatic pump. The Na Pali comes with a detachable seat, allowing you to sit on it for a kayak-style ride. You also get three removable fins so you can customize maneuverability to taste. Note that a paddle is not included. On the water, the Na Pali feels exactly like a fiberglass paddleboard. The seat is well-designed and comfortable, making for a fine kayak mode. Take off the seat, stand up and paddle, and the board feels nice and stable. I was consistently surprised by the Na Pali's solid and stiff feel—this just doesn't seem at all like an inflatable watercraft. On the ruggedness front, expect good to excellent durability provided you are reasonably careful to avoid puncture threats. Overall, I think the Na Pali delivers exactly what you'd hope for: a fully-functional paddleboard that you can easily break down and store in your trunk or closet. Yes, it is expensive, but it's competitive with glass boards, and a whole lot more portable.